Tamara Baggett graduated from Brigham Young University in elementary education and has taught preschool and elementary school for thirteen years. She lives in West Jordan, Utah, with her husband, Chuck, and their four young children. 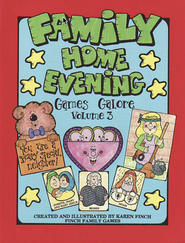 This book has helped our young family so much with family home evening. We all take turns every week to organize a program and prepare a lesson, our six year old daughter can find a topic she thinks is important from this book and base her whole lesson around it. We enjoy using this book as the gospel principles which are taught are simple and easy to understand for our whole family!! For families with small children. This is a great resource for FHE for families with small children and the attention time frame is short. It is straight, forward and to the point which is great when you have a 3 and 1 year old like my wife and I have. For families with older children I personally would not want this. 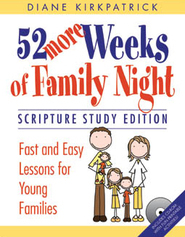 A good book with simple lesson for family nights for those who don't have much time to prepare. This is a handy little book. This book is great to get you in the habit of FHE. It is geared toward smaller children but easily adapts for older ones. Its topics are simple. I was disappointed with this book. I was expecting there to be much more interaction in the form of games and activities. Picking a picture is not very interactive or attention -grabbing. You can get better ideas from The Friend, the Family Home Evening manual, or by just using your own creativity. I used this book once after getting it and have not used it again. 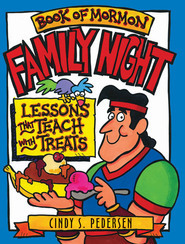 The book is good for fast family nights when your not putting any thing in to it. It would be better for toddlers if you had coloring picture's to go with your lesson. once they choose the picture's for the lesson you loose them, they are no longer interested. I think this is a great resource for young families. I usually have the activity planned and have a difficult time with the lesson. I love that it is so simple and has the scripture and song all ready. With a little extra planning I have easily been able to find an activity to go with the lessons.